The inaugural KQ flight at the John F Kennedy airport in New York. "The addition of flights to Rome and Geneva will be welcomed by both our leisure and business customers," says KQ chief executive Sebastian Mikosz. "Rome with its status of a 'global city' is also rich with history and culture making it one of the top tourist destination in the world while Geneva hosts the highest number of international organisations in the world such as the United Nations (UN), making it a global hub for diplomacy," he added. Mr Mikosz said Geneva is a perfect complement for Nairobi, which is also Africa's hub for UN headquarters among other international agencies. 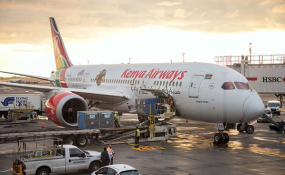 "With this route, Kenya Airways will offer excellent connections from these two cities to its 43 destinations in Africa for business, diplomatic missions, and tourism," said the CEO.